In our previous blog, we tackled the subject of orthodontics for teens. But did you know we have treatment options to help children in Fort Worth enjoy healthier, more even smiles? With fixed and removable oral appliances, we can help correct alignment in your child’s early years. Let’s look at how we address uneven smiles in childhood! Multiple factors could lead to the onset of misalignment in children. For example, issues with the size of the jaw could lead to uneven tooth eruption, and breathing obstruction due to problems with airways may also cause misalignment. These factors include thumb sucking, tongue thrusting, and premature tooth loss. We suggest bringing children in to see the orthodontist as young as age seven. 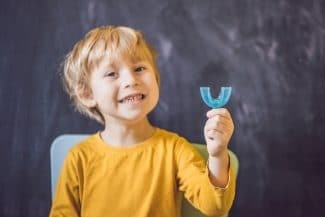 We will then carefully examine your child’s smile to see if he or she is at risk of developing issues with malocclusion. If so, then we can move forward with orthodontic solutions. What makes an uneven smile so problematic for our oral health? First, the issue makes proper brushing and flossing difficult, allowing food particles to remain trapped between teeth and leading to a greater risk of tooth decay and gum disease. Other people may experience strain on the jaw joints, leading to TMJ disorder and bruxism. Finally, the impact on your child’s appearance could lead to issues with self-confidence. In order to address these complications, one needs orthodontic treatment. We typically don’t place braces or recommend Invisalign® until a young patient is in the teens, at which point the jaw is still developing but not undergoing massive shifts. For young children, we may prescribe phase I orthodontics. We will create custom-made oral appliances, such as retainers, which your little one will wear for at night or during the day. The appliance shifts the position of the teeth while also guiding the growth and development of the jaw and oral structures. Over time, these initial orthodontics help change the smile. As your child grows older, this limits the severity of misalignment and reduces the amount of time he or she will need orthodontics, such a braces or aligners. If you have any questions about our childhood interceptive orthodontics, then contact our team today, We want to help your entire family enjoy beautiful, even smiles that last a lifetime! We want to help people of all ages enjoy a healthy smile, from kids and teens to adults and seniors. To schedule your consultation and discuss our interceptive orthodontics, please call Lake Country Orthodontics in Fort Worth, TX at (817) 236-7846. Our office proudly serves patients who live in Ft. Worth, Rome, Haslet, Azle, and all surrounding communities.